Chanel No. 5: A brain parasite may be the secret to the famous perfume. Is the secret to Chanel No. 5’s success a parasite? On the fifth day of the fifth month of 1921, Coco Chanel changed the scent of the world. She released Chanel No. 5 as her final vaudeville act—her only child. The perfume would grow to be “le monstre” of the perfume industry, a $300-per-ounce, elegant mist still anchoring the multibillion-dollar Chanel empire. It succeeded where others had never tried by combining the cheap, musky scent of the courtesan demi-mondaines—the “women of the half-world,” as Coco herself was—with the light, single florals reserved for the upper class of Parisian women. Needing a musky base note, Coco resorted to an old perfumer’s trick: scrapings of sexual pheromones from the perianal gland of the Abyssinian civet cat. Why is it that the elite French perfumers (known as “noses”) and sommeliers (“upturned noses”) of the world spend so much of their time inhaling cat effluvia from expensive glass bottles? A guess: It may have to do with a mind-control parasite called Toxoplasma gondii. The tiny protozoan may be getting into our brains and tricking us into liking cats—not to mention certain perfumes and wines. In a recent study, Czech scientists gave men and women towels scented with the urine of various animals—horses, lions, hyenas, cats, dogs—which they rated for “pleasantness.” Turns out, men who tested positive for Toxo found the smell of cat urine more pleasant than men without Toxo. For Toxo researchers like me, this was a shock but not entirely surprising. Why? Toxo does approximately the same thing to rats. Toxo reproduces only in a cat’s stomach and needs an intermediate host to taxi from one cat to the next. Enter le rat. Toxo infects the rat brain and scrambles neurons to make the rat less afraid of cat urine. How? The neural circuitry for fear is right next to the neural circuitry for sexual attraction in male rats, and it seems Toxo can hijack the sexual attraction circuit to respond to cat urine. A less-afraid (and maybe even a little turned-on) rat is thus a likelier-to-be-eaten rat, allowing Toxo to settle in the new feline host and start the lifecycle anew. Sometimes, though, Toxo ends up in a human’s brain (an evolutionary dead end for the parasite, unless you are Val Kilmer), courtesy of forgetting to wash one’s hands after cleaning cat litter—the parasite is in cat feces—or eating undercooked meat with Toxo in it—livestock often stomp around on beds of fertilizer made from, yes, cat feces. Worldwide, 1 billion to 2 billion people have the tiny Toxo parasite in their brains. Once you play host to Toxo, you have it for life. But unlike most anything else that finds a way into your brain, it’s basically harmless as long as your immune system is working and you aren’t pregnant. It’s possible that Toxo is doing something to the host human brain—we just don’t yet know what. Now, maybe the men with Toxo from the Czech study have pet cats at home (making them more likely to pick up Toxo) and the cat pee evokes Elysian fondness for their Fluffypuss. In this case, Toxo does absolutely nothing but is still correlated with preferring the smell of cat urine. Or maybe these men with Toxo romantically incline to cat-ladies—women with Toxo might be more promiscuous, after all. Or maybe, like with the rats, Toxo is changing something about the way the brain processes cat smells, making the men with Toxo find it more pleasant. Could it be that Toxo is the perfumer par excellance, with privileged access to the very seat of smell itself? Is it a coincidence that “le monstre” of the perfume industry and the Bordeaux sauvignon blanc both come from France, a country with one of the highest rates of Toxo in the world? Why would a perfumer spend her days perfecting aldehydes and tinctures to recreate the smell of water at midnight when she could—if unintentionally—exploit the fact that 45 percent of her French countrymen have parasites in their brains that may be skewing the inner, subjective world of smell? The history of perfume is an intimate history of animal come-hithers. Despite rampant speculation the human pheromone, like dark matter, has yet to be discovered, let alone bottled (“pheromone parties” in Los Angeles and New York notwithstanding.) So instead we outsource production to animals. But why some over others? It may be a coincidence, but it is nevertheless worthy of note that in ancient Egypt, home of the world’s first perfumers, home of some of the earliest domesticated cats, where the penalty for killing cats was death, where it was a crime to not save a cat from a burning building, Bastet served as god of both perfume and cats. Clearly most of these ideas are unprovable, a fancy feast of unfalsifiable theory—often both the most interesting and the most useless line of inquiry for the scientist. 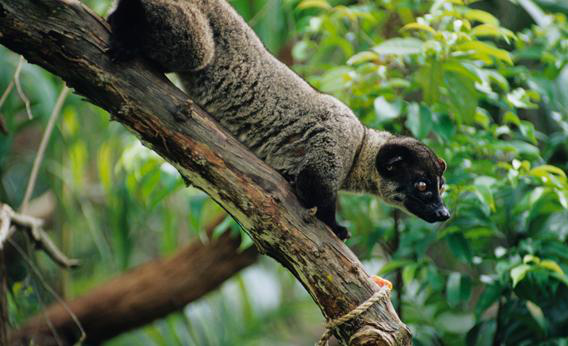 Do civets and domestic cats use similar pheromones? Unknown. Is Toxo really altering human response to cat odors, like in the rats? Unknown. Do people with Toxo prefer Chanel No. 5 over those without Toxo? We may never know. Chanel stopped using civet in 1998 in No. 5 for animal rights reasons, replacing it with a synthetic version (though you can still buy vintage). No word on if the new No. 5 is any less popular. As a company, Chanel marks its territory like a cat does its palm fronds. Decades of spokesmodels from Keira Knightley to Audrey Tautou to Nicole Kidman all leave an elegant Chanel No. 5 sillage in their wake long after they leave both the room and their suitors behind. Marilyn Monroe, arch-queen of the human come-hither, claims she wore to bed nothing but “two drops of Chanel No. 5.” Perhaps instead we should think of her bedroom as not her own territory, nor DiMaggio’s, nor Arthur Miller’s, nor JFK’s—but, rather, the extended territory of a lonely civet cat.